Major updates to high-end illustration and design tools can be hit or miss, but Corel Painter 12 slams this one way out of the park. The 12th iteration of the program contains significant improvements across the board, from intangible but visible performance gains to enhancements to older tools to a set of new tools that should have any professional artist drooling with desire. The most impressive new tools bring a hefty dose of "reality" to Painter. The new Real Watercolor and Real Wet Oil paints do an amazing job of mimicking their real-world counterparts. Viscosity, blending, and drying are all replicated with realism. Along with expected tools like paper texture choices and customizations, which can be used to alter how the paint pools and flows, you have control over other "real-world" conditions. You can alter the "wind" and the rate at which the paint dries, how the paint pigmentation alters as it dries on the paper grain, and adjust how the paint gets applied to the paper with the new paintbrush controls. The "RealBristle" paintbrushes are designed to replicate how actual paintbrushes behave, but with a tablet. Corel says that it's the most realistic digital-painting experience around, and at least at the consumer level this is not hard to believe after a day of testing. The new brush controls offer a deep bench of settings, such as brush size, opacity, squeeze, and angle. The toggles are all located centrally, making it easy to adjust on the fly. Scalable resizing lets you preserve correct brush proportions, and there are shortcuts available for faster settings tweaks. Photoshop users should find them appealing, especially with new airbrush variants. Other new tools include kaleidoscope painting, which allows the artist to paint once and have the image replicated kaleidoscope-style across the canvas; mirror painting for symmetrical art; a new color changer palette; new clone source palette; big improvements to workspace customization options; and an improved image browser. The performance gains are not insubstantial, either. Corel Painter 12 now supports multicore computers and Windows 7. Corel says brush performance should be 3 to 5 times faster than in Painter 11, and processor-intensive tasks like large-file flattening, flipping, or blurring should be 1.5 times to 3 times faster. It also continues to support importing files from Photoshop, to make transitioning between the two easier. 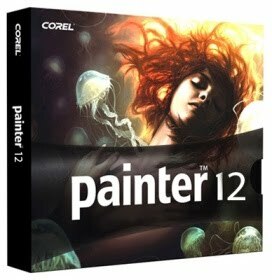 Corel Painter 12 is aimed at the professional and the professional amateur. It's a hefty tool, a grand slam of a program perfectly suited to the task of creating realistic, salable art on your computer.